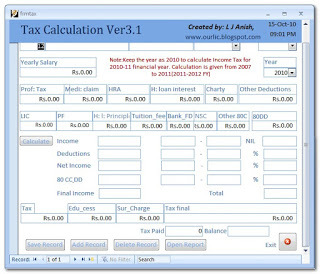 Income tax calculator is a useful software which can be used to calculate income tax payable accurately for the years 2015-2016 to 2007-2008. Give the starting year of the financial year in the “Year” text box for which you want to calculate tax and then click the “Calculate” button . 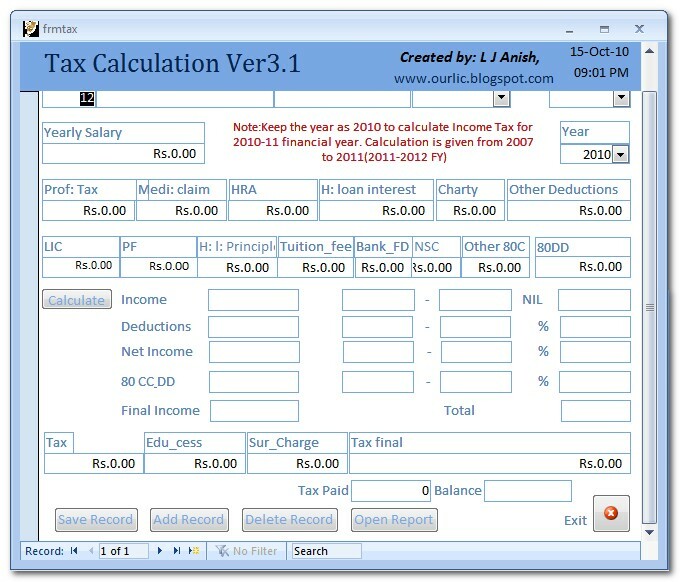 This software will allow you to store and calculate income tax of a single person or a group of people and a report can also be generated. One prerequisite for running this software is that the macro security level of the Microsoft access should be kept to medium or low. Macro security level can be changed from the options tab under the tools menu of the access. (If you have any problem mail me at [email protected]). Make sure to enable the macros option when prompted while starting the software. Keep the year of calculation as 2009 to calculate the income tax for the current year. You can also calculate tax through an On-line Income Tax Calculator by clicking here. Click to download Income Tax calculator. ← Magic Plus- Free presentation software for LIC’s Endowment plus and Pension plus.